(Nanowerk News) If you can uniformly break the symmetry of nanorod pairs in a colloidal solution, you’re a step ahead of the game toward achieving new and exciting metamaterial properties. But traditional thermodynamic -driven colloidal assembly of these metamaterials, which are materials defined by their non-naturally-occurring properties, often result in structures with high degree of symmetries in the bulk material. In this case, the energy requirement does not allow the structure to break its symmetry. In a study led by Xiang Zhang, director of Berkeley Lab’s Materials Sciences Division, he and his research group at the University of California (UC) Berkeley achieved symmetry-breaking in a bulk metamaterial solution for the first time. Zhang and his group demonstrated self-assembled optical metamaterials with tailored broken-symmetries and hence unique electromagnetic responses that can be achieved via their new method. The results have been published in Nature Nanotechnology ("Feedback-driven self-assembly of symmetry-breaking optical metamaterials in solution"). Simulation of feedback driven self-assembly in mass assembly-line. The tilted network indicates aqueous flow in space (blue reservoir). The plasmon gauged potential (red) phothermally dissociates unwanted assemblies and re-assembles into the desired dimers. This led the group to produce nanostructures that have historically been considered impossible to assemble. The widely used method of metamaterial synthesis is top-down fabrication such as electron beam or focus ion beam lithography that often results in strongly anisotropic and small-scale metamaterials. The bottom-up route fills these requirements. Starting with a solution of colloidal nanorods, Yang and Ni built on the common self-assembly technique used to build nanoparticles. The twist that they added was to introduce a feedback mechanism by which to obtain the desired product. The desired product when synthesizing colloidal gold nanorods, which are stabilized during growth to obtain preferential bonding along longitudinal facets, is pairs of rods, or dimers, that are shifted by a certain amount: their symmetry is uniformly broken. “When you have this reaction, you get all kinds of products. You have a pair of nanorods with no shift at all relative to one another; or a pair that are shifted too much; or not enough. This is a typical process and is governed by thermodynamics,” explains Yang. 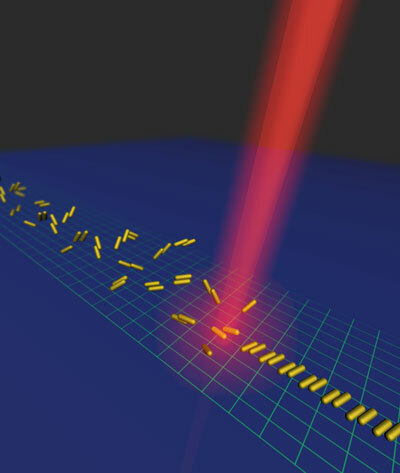 The team used a laser to excite the plasmonic resonance of specific particles produced in the reaction. This allowed them to separate out the un-desired resonances, indicating nanorod pairs that are not shifted the desired amount, and dissociate those pairs using heat from the excitation. “Only the desired resonance survives in this process,” Ni says. “Then the reaction can be repeated to produce more of the desired, broken-symmetry particles based on their plasmonic signature. Clear distinction in resonance profiles makes this a highly selective method. The method developed in Zhang’s research group can be applied to many other nanoparticles; indeed, almost any structure that can self-assemble could be produced in this way. This solves the problem of achieving large scale symmetric breaking, and can open the door to new properties and applications. The unique feedback mechanism leads to precisely controlled nanostructures with beyond conventional symmetries and functionalities. “As a demonstration in our paper, we have synthesized a new class of symmetry-breaking optical metamaterials that have isotropic electromagnetic responses and can be used in a number of important applications, such as subwavelength imaging, optical cloaking and sensing,” says Yang. “In contrast to the conventional wisdom that a material’s structure determines its properties, we provocatively suggest that the physical properties of materials, by design, may dictate the evolution of self-assembly and self-determine the structures of bulk materials.” concludes Zhang.